Astronauts on the Space Shuttle Discovery STS-82 mission significantly upgraded the scientific capabilities of NASA's Hubble Space Telescope (HST) during the ten-day servicing mission by installing two state-of-the-art instruments. 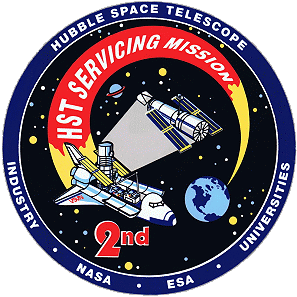 It was the second in a series of planned servicing missions to the orbiting Hubble Space Telescope. 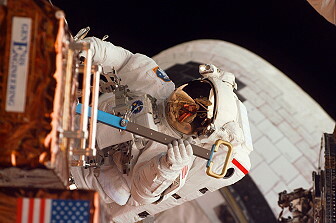 The astronauts also performed maintenance to keep HST functioning smoothly until the next scheduled servicing mission. In addition to installing the new instruments, astronauts replaced other existing hardware with upgrades and spares. 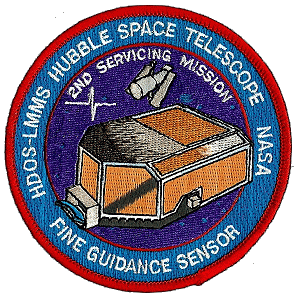 Hubble got a refurbished Fine Guidance Sensor, an optical device that was used on HST to provide pointing information for the spacecraft and was used as a scientific instrument for astrometric science. The Solid State Recorder (SSR) replaced one of HST's current reel-to-reel tape recorders. The SSR provides much more flexibility than a reel-to-reel recorder and can store ten times more data. The HST was designed to allow new instruments to be easily installed as old ones become obsolete. 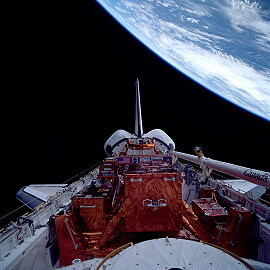 This was demonstrated during the first servicing mission (STS-61) in December 1993, when, during an 11-day mission that included a record five EVAs, astronauts successfully installed a new camera which had its corrective optics built right in, and a special instrument, called the COSTAR (Corrective Optics Space Telescope Axial Replacement) that would properly refocus light from the flawed main mirror to the other instruments. The new instruments installed during STS-82 again dramatically expanded Hubble's scientific capabilities. The Space Telescope Imaging Spectrograph (STIS) provides unique and powerful spectroscopic capabilities for the HST. A spectrograph separates the light gathered by the telescope into its spectral components so that the composition, temperature, motion, and other chemical and physical properties of astronomical objects can be analyzed. The Near Infrared Camera and Multi-Object Spectrometer (NICMOS) promises to gain valuable new information on the dusty centers of galaxies and the formation of stars and planets. NICMOS consists of three cameras. It will provide the capability for infrared imaging and spectroscopic observations of astronomical targets. NICMOS gave astronomers their first clear view of the universe at near-infrared wavelengths between 0.8 and 2.5 micrometers - longer wavelengths than the human eye can see. The expansion of the universe shifts the light from very distant objects toward longer red and infrared wavelengths.. 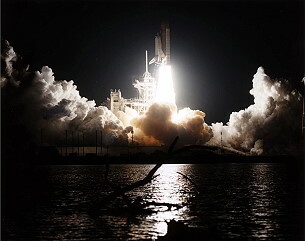 The rendezvous and retrieval operations associated with the Hubble Space Telescope were similar to those carried out on other missions requiring capture of a free-flying satellite in orbit. 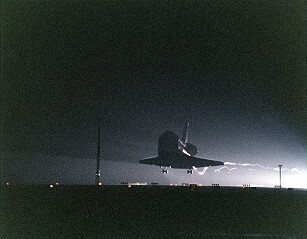 Discovery's initial rendezvous burn was actually the liftoff of the Space Shuttle itself. The launch was precisely timed to occur during about a one hour period as the telescope passed within the desired range from the Shuttle. After launch, the crew could oversee a number of orbit adjust burns to catch up with and retrieve the telescope on flight day three of the mission. 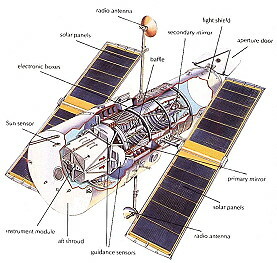 Once Discovery was safely in orbit and the payload bay doors were opened, signaling the start of orbital operations, activation of the Ku-band antenna on the orbiter takes place. The dish-shaped antenna was used to provide radar data to the crew and ground during the rendezvous process. The day after launch, the crew checked out the Remote Manipulator System (RMS), or robot arm that was used throughout the mission. Also, activation of the space support equipment was performed. This included activating the flight support system and heaters on the various orbital replacement unit (ORU) containers housing scientific instruments and hardware that will be installed on and in the telescope. 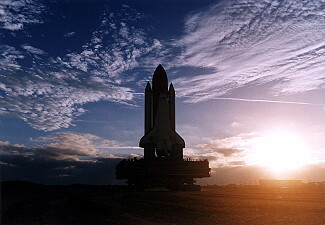 The terminal initiation, or TI, burn occurred about two hours prior to capture as the Shuttle reached a distance of about eight miles in front of the telescope. 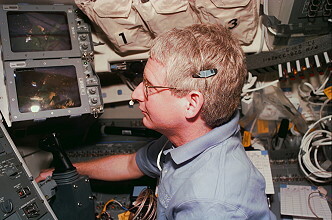 Several small midcourse correction burns followed before Commander Kenneth Bowersox, who was the pilot on the first servicing mission to Hubble, took over manual control of Discovery at a distance of about 2,400 feet (731.5 meters) below the telescope. The approach from underneath minimizes any potential contamination to the telescope from the Shuttle's thruster firings. Prior to capture, a ground-commanded maneuver of the telescope was performed to align its two grapple fixtures with Discovery's robot arm. 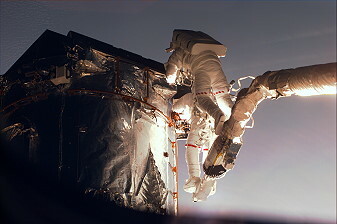 Once Discovery was within 35 feet (10.7 meters) of Hubble, astronaut Steven Hawley used the robot arm to capture the telescope at one of the two grapple fixtures located midway up the HST structure. 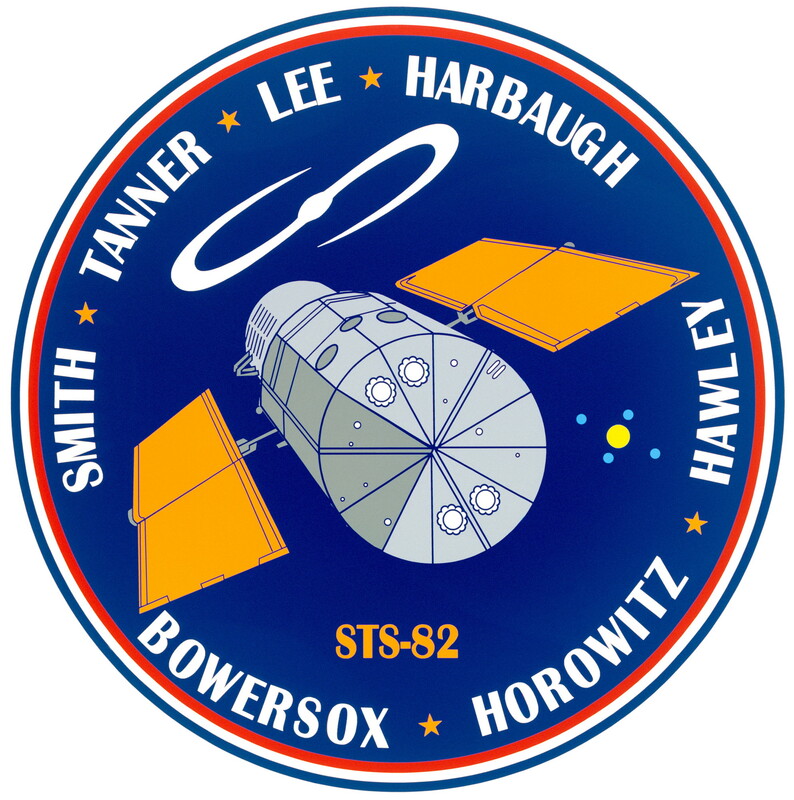 Steven Hawley's last mission was STS-31 on which he also served as the primary operator of the robot arm, deploying Hubble for its astronomical mission. Following its capture, the telescope was lowered onto the flight support system, a turntable likened to a lazy susan for its ability to rotate and tilt to assist in the servicing tasks. An electrical cable was remotely attached to provide orbiter power to the telescope throughout the servicing portion of the mission. The four EVA astronauts worked in two different teams to perform the tasks, alternating to allow a rest day between spacewalks. Mark Lee and Steven Smith were scheduled to perform the servicing tasks on the first and third spacewalks and Gregory Harbaugh and Joseph Tanner worked on the telescope on EVAs two and four. While outside conducting the spacewalks, Mark Lee was distinguished by continuous red stripes around the arms and legs of his suit. Gregory Harbaugh's spacesuit had a broken red stripe on the arms and legs. Steven Smith and Joseph Tanner were sharing the upper half of the third spacesuit and each had his own lower portion. Steven Smith had no markings on his suit making it all-white, and Joseph Tanner was distinguishable by diagonal red striping around the legs. The first EVA was performed by Steven Smith and Mark Lee on February 14, 1997 (6h 42m) to replace the Goddard High Resolution Spectograph (GHRS) by the Space Telescope Imaging Spectograph (STIS) and the Faint Object Spectrograph (FOS) by the Near Infrared Camera and Multi-Object Spectrometer (NICMOS). The Space Telescope Imaging Spectrograph replaced the Goddard High Resolution Spectrograph (GHRS). It includes all the major capabilities of both the current spectrographs, the GHRS and the Faint Object Spectrograph (FOS) and added new technological capability. The STIS optical design features internal corrective optics to compensate for the HST primary mirror spherical aberration. STIS is an instrument that spans ultraviolet, visible, and near infrared wavelengths. It separates the light gathered by the telescope into its component colors allowing scientists to analyze the composition of celestial objects - their temperature, motion, and other chemical and physical properties. STIS's main advance is its capability for two- dimensional rather than one-dimensional spectroscopy. STIS's two-dimensional detectors allow the instrument to gather 30 times more spectral data and 500 times more spatial data than existing spectrographs on Hubble, which look at one place at a time. This means that many regions in a planet's atmosphere or many stars within a galaxy can be recorded in one exposure making the HST faster and more efficient. One of the greatest advantages to using STIS is in the study of supermassive black holes. STIS contains a new generation electronic light sensor called a Multi-Anode Microchannel Array (MAMA), as well as a Charge Coupled Device (CCD). STIS's coronograph allows it to search the environment of bright stars for very faint companion objects (possible planets). STIS is also capable of taking ultraviolet images like a camera. The Near Infrared Camera and Multi-Object Spectrometer replaced the Faint Object Spectrograph (FOS). Like STIS, NICMOS's design features corrective optics to compensate for HST's primary mirror spherical aberration. NICMOS provides the capability for infrared imaging and spectroscopic observations of astronomical targets. Its detectors perform much better than previous infrared detectors. NICMOS will give astronomers their first clear view of the universe at near-infrared wavelengths between 0.8 and 2.5 micrometers - longer wavelengths than the human eye can see. NICMOS contains three cameras, each with a different spatial resolution. Camera 1 has the highest resolution for very finely detailed pictures at the shorter near infrared wavelengths. Camera 2 has the next highest resolution for detailed pictures at longer wavelengths, and Camera 3 has a much wider field of view to encompass extended objects at slightly lower resolution. Each camera has its own wheel of filters and optical components. Each individual camera can operate independently while the other cameras are also taking images. NICMOS is much more than a camera. It is also a spectrometer, a coronograph and a polarimeter. Each of these operational modes is initiated by rotating the proper element in a wheel containing filters and optical components into the camera beam. A combination of grating and a prism called a grism provides spectroscopy for NICMOS. A set of polarizers in the wheel are rotated into place when observers want to determine the degree of polarization of radiation from a celestial object. One of the cameras has a special set of masks to block light from a bright object to observe an adjacent faint object, such as a faint planet near a bright star. This is called a coronograph. The sensitive infrared detectors in NICMOS must operate at very cold temperatures, 58 degrees Kelvin (minus 355 degrees Fahrenheit), because any heat from surroundings will create extra infrared signals that would interfere with the actual signal from the object being studied. NICMOS keeps its detectors cold inside a cryogenic dewar (a thermally insulated container) containing frozen nitrogen. The dewar cools the detectors for up to five years. NICMOS is HST's first cryogenic instrument. The second EVA by Joseph Tanner and Gregory Harbaugh occurred on February 15, 1997 (7h 27m) in which the Fine Guidance Sensor (FGS) and one Engineering / Science Tape Recorder (ESTR) were exchanged and the Optical Control Electronics Enhancement Kit was installed. A refurbished Fine Guidance Sensor (FGS) replaced an existing FGS on this mission which was showing signs of mechanical wear. There are three fine guidance sensors on the HST located at 90-degree intervals around the circumference of the telescope. Two FGSs are used to point the telescope at an astronomical target and then hold that target in a scientific instrument's field of view. The third FGS can be used as a scientific instrument for celestial measurements (astrometry). The replacement FGS was fitted with a new mechanism to accomplish better optical alignment. Once this spare was exchanged for one of the original units, the telescope operators were able to compensate for changes due to on-orbit conditions and optimize its performance by keeping the FGS more finely tuned. The fine guidance sensors are one of five different types of sensors used by the HST's pointing control system to point the telescope at a target with an accuracy of 0.01 arcsecond (an arcsecond is 1/3600 of a degree). The guidance sensors lock on to a star and then measure any apparent motion to an accuracy of 0.0028 arcsec. This gives the HST the ability to remain pointed at that target with no more than 0.007 arcsec. of deviation over long periods of time. This level of stability is comparable to being able to hold a laser beam focused on a dime 200 miles (370 km) away (about the distance from Washington, DC, to New York City). Fine Guidance Sensors can also be used for astrometry, which is the science that deals with determination of precise positions and motions of stars and other celestial objects. The FGSs can provide star positions that are about 10 times more precise than those observed from a ground-based telescope. The Engineering Science Tape Recorder (ESTR) stores data onboard the telescope. There are three ESTRs onboard the HST. Engineering data are recorded during periods when no communications with the ground are scheduled. Science data are always recorded to prevent loss of data if an unplanned communications outage should occur. In normal operations, two ESTRs are used to record science and the third records engineering data when necessary. One of the ESTRs had failed and was replaced with an identical flight spare ESTR. The Optical Control Electronics Enhancement Kit is a cable that is used on the Optical Control Electronics box to reroute signals to send commands to move the new adjustable mirror that is internal to the Fine Guidance Sensor. In a third EVA on February 16, 1997 (7h 11m) the astronauts Steven Smith and Mark Lee exchanged one Data Interface Unit (DIU) and replaced a second ESTR by a Solid State Recorder (SSR). At last they removed an older Reaction Wheel Assembly (RWA) and installed a new one. Four Data Interface Units (DIU) on HST provide command and data interfaces between the spacecraft's data management system and the other HST subsystems. DIU-2 was replaced with a spare unit that has been modified and upgraded to correct for failures that occurred in the original unit. The Solid State Recorder (SSR) replaced one of HST's current reel-to-reel recorders. The data management system of the HST includes three tape recorders to store engineering or science data that cannot be transmitted to the ground immediately. The SSR has no reels, no tape and no moving parts to wear out. The SSR is about the same size as the reel-to-reel recorder, but it can store ten times as much data in computer-like memory chips until HST's operators at GSFC command the SSR to play it back. The SSR stores 12 gigabits of data, while the tape recorder it replaces stores only 1.2 gigabits. The SSR has two memory units. Each is a microelectronics device with 16 megabit chips stacked in a package and six packages in an array. There are three arrays in a group. In the event of a failure in a chip, a single row of the chips can be skipped over leaving the rest of the memory fully functional. One of Hubble's four Reaction Wheel Assemblies (RWA) was replaced with a refurbished spare. The RWA is part of Hubble's Pointing Control Subsystem. Spin momentum to the wheels moves the telescope toward a target and maintains it in a stable position. The fourth and final planned EVA was conducted by Joseph Tanner and Gregory Harbaugh on February 17, 1997 (6h 34m). They exchanged one of the Solar Array Drive Electronics (SADE) and installed some covers on the magnometers. 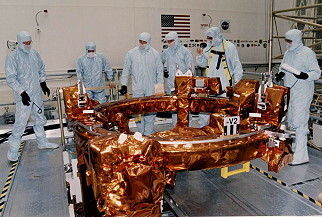 After this task they photographed the damages and started to repair the thermal isolation on the HST - this was not planned, but the isolation was rather damaged. The Solar Array Drive Electronics (SADE) control the positioning of the solar arrays. HST has two SADEs. 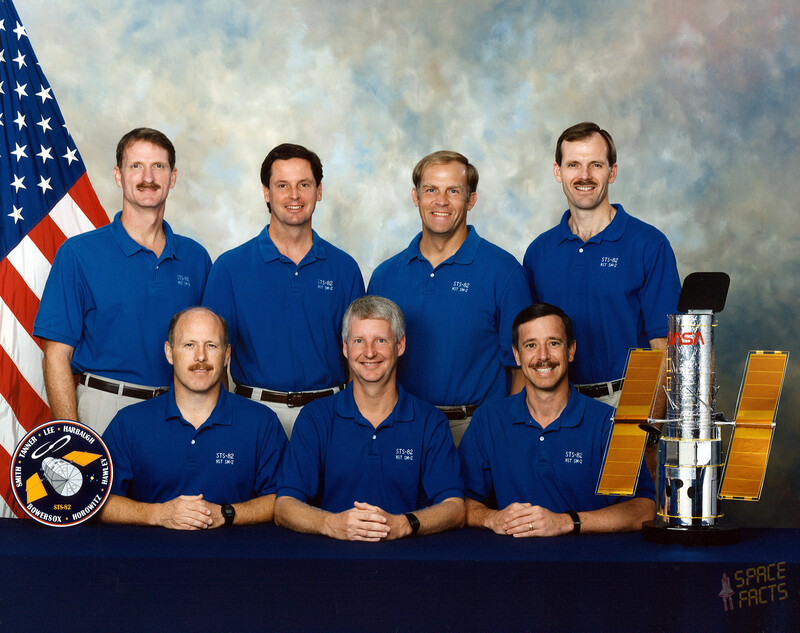 One unit was replaced during the first servicing mission. The unit that was returned from orbit has been refurbished to correct for problems that resulted in transistor failures and was used to replace the second unit, SADE-2. 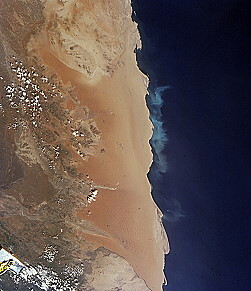 The SADEs are provided by the European Space Agency. Meanwhile the NASA managers decided to add a fifth spacewalk to complete the most important repair work at the isolation. In a final not planned EVA on February 18, 1997 (5h 17m) the astronauts Steven Smith and Mark Lee completed repairing work on the isolation. The spacewalkers attached several thermal insulation blankets to three equipment compartments at the top of the Support Systems Module section of the telescope which contain key data processing, electronics and scientific instrument telemetry packages. Near the end of spacewalks two, three and four, the Shuttle's small vernier thruster jets were fired from 20 minutes to about one hour to provide a subtle increase of the Hubble Space Telescope's altitude by approximately five nautical miles (9.26 km). This procedure, tested on two previous Shuttle flights (STS-78 and STS-79), proved the feasibility of reboosting Hubble while in Discovery's payload bay. The vernier jets were used for the reboost because of the loads that potentially could be imparted to the HST solar arrays, which will not be stowed as the arrays were during STS-61. The reboost plan calls for the small thrusters located on the tail to fire continuously throughout the daily reboost while those located on the left and right of the nose fire sequentially at one minute intervals. The reboost was desired to counteract aerodynamic drag effects which tend to lower Hubble's orbit. 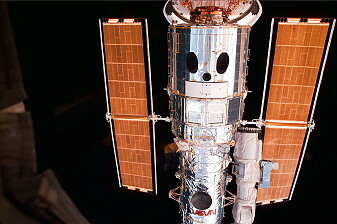 On February 19, 1997, the solar arrays on Hubble were pointed toward the sun to provide electrical power and to charge the telescope's batteries. 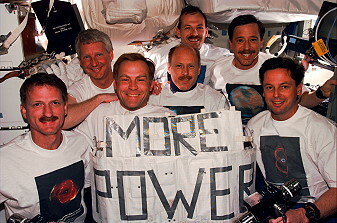 The robot arm was used to grapple HST once again followed by transfer of power to the internal system from the orbiter power. The telescope was lifted off of the rotating flight support system and released over the side of Discovery in similar fashion to the deploy following the first servicing mission.